A lemon shark (Negaprion brevirostris) circles towards the camera. Bahamas. A blue shark (Prionace glauca) in waters off New England. Head on shot of a lemon shark (Negaprion brevirostris) at dusk. Bahamas. A lemon shark (Negaprion brevirostris) at dusk. Bahamas. Head on shot of great hammerhead shark (Sphyrna mokarran) in the Bahamas. Tahitian stingrays (Himantura fai), sharks and jacks on a sandbar off Moorea, French Polynesia. Diver holds off a huge and pregant tiger shark (Galeocerdo cuvier) with his camera. Bahamas. Great hammerhead shark (Sphyrna mokarran) in the Bahamas. A whale shark (Rhincodon typus) on a deep reef in the Galapagos Islands. An oceanic whitetip shark (Carcharhinus longimanus) in blue open water. Bahamas. A lemon shark (Negaprion brevirostris) swims over an orange sponge. Bahamas. Two great hammerhead sharks (Sphyrna mokarran) in the Bahamas with nurse sharks in the background. Bull shark (Carcharhinus leucas) extends jaw. Fiji. Many bull sharks (Carcharhinus leucas). Fiji. Gray reef sharks (Carcharhinus amblyrhynchos) congegrate in Fakarava South Pass (Tetamanu Pass), French Polynesia. During the day the sharks swim slowly against the tidal current in the channel. They hunt at night when the reef fish are resting and are easier to catch. Lemon sharks (Negaprion brevirostris) on a turbid, green water morning. Bahamas. 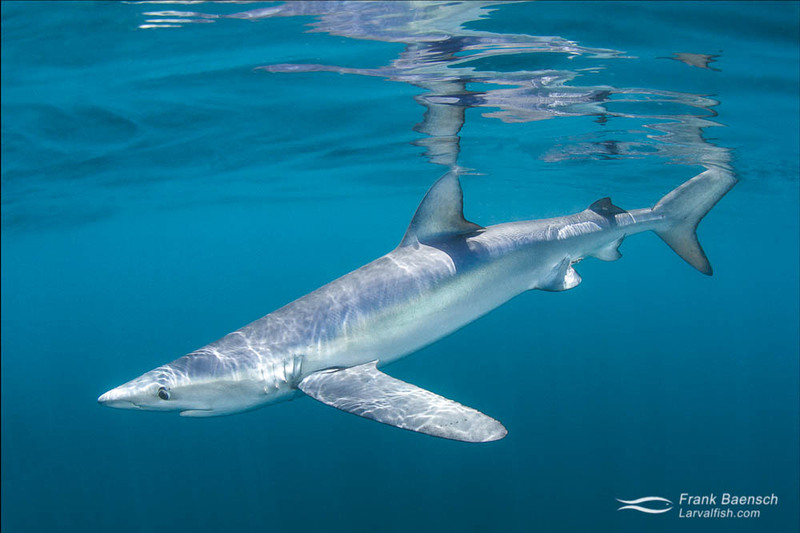 Blue shark (Prionace glauca) at twilight. Rhode Island. A lone manta ray (Manta birostris) in the distaince cruises by a cliff at dusk. Socorro. Tiger shark (Galeocerdo cuvier) off Tahiti, French Polynesia. A lemon shark (Negaprion brevirostris) on white sand bottom next to a starfish. Bahamas. Indonesian speckled Epaulette Shark (Hemiscyllium freycineti). This species belongs to the bamboo shark family. It is nocturnal, hiding in reef crevices during the day. Reproduction is oviparous. It has the ability to survive low oxygen conditions by switching off non-essential brain functions - apparently an adaptation for hunting in tide-pools. Indonesia. Motion blue of nurse shark (Ginglymostoma cirratum) over sand in the Bahamas. Blacktip reef sharks on a sandbar with Moorea's mountains in the background. French Polynesia. A lemon shark (Negaprion brevirostris) near the surface at dusk. Bahamas. Great white shark (Carcharodon carcharias). Guadeloupe Island. A shortfin mako (Isurus oxyrinchus) in waters off New England. Lemon shark (Negaprion brevirostris) swims over purple sponge in the Bahamas. Whitetip reef shark (Triaenodon obesus) circles a pinnacle at Cocosl Island. Upclose encounter of sand tiger shark (Carcharias taurus) surrounded by round scad (Decapterus punctatus). North Carolina. Tiger shark (Galeocerdo cuvier) cruises over a reef in the Bahamas. Ventral view of scalloped hammerhead shark (Sphyrna lewini) at Cocos Island. Costa Rica. Magic hour! Motion blur of blue shark (Prionace glauca) at twilight off New England. Rhode Island. White shark (Carcharodon carcharias). Guadeloupe Island. Whale shark (Rhincodon typus) silhouette. Mexico. An oceanic whitetip shark (Carcharhinus longimanus) breaks the surface. Bahamas. Dusky shark (Carcharhinus obscurus) at night. Bahamas. A lemon shark makes eye contact. Bahamas. Lemon sharks are viviparous, females giving birth to between 4 and 17 young every other year in warm and shallow lagoons. The young have to fend for themselves and remain in shallow water near mangroves until they grow larger. With increasing size, the sharks venture further away from their birth place. At maturity at a size of 1.5 to 2 m and an age of 12 to 15 years, they leave shallow water and move into deeper waters offshore. However, little is known of this life stage. Maximum recorded length and weight is 340 cm and 183 kg. Bahamas. An oceanic whitetip shark (Carcharhinus longimanus) on the surface from below. Bahamas. Whale shark (Rhincodon typus) feeding on the surface in Mexico. A sand tiger shark (Carcharias taurus) inside a wreck off North Carolina. None really knows why these sharks aggregate on wrecks. Food supply, reproduction, water temperature and shelter may all be involved. Caribbean reef shark (Carcharhinus perezi). Bahamas. Marbled ray (taeniura meyeni) and fish reef scene at Cocos Island. Costa Rica. Great hammerhead shark (Sphyrna mokarran) with rusted fish hook in its mouth at dusk in the Bahamas. Head on shot of a blue shark (Prionace glauca) on the surface. Rhode Island. Nurse sharks (Ginglymostoma cirratum) squirts water while swimming onto dock for food. Bahamas. Two whale sharks (Rhincodon typus) feeding on tuna eggs at the surface. Mexico. A young tiger shark (Galeocerdo cuvier) and lone bar jack on white sand in the Bahamas. Whitetip reef sharks (Triaenodon obesus) hunt small reef fish hiding in the coral at nght. Cocos Island. Costa Rica. Reef shark (Carcharhinus perezi) silhouette. Bahamas. A diver films a sand tiger shark (Carcharias taurus) on a deep wreck off North Carolina. Sand tigers are very tolerant of divers. Upclose encounter of a sand tiger shark (Carcharias taurus) surrounded by round scad (Decapterus punctatus). North Carolina. Caribbean reef shark (Carcharhinus perezi) above red sponge on a reef in the Bahamas. Upclose encounter with two sand tiger sharks (Carcharias taurus). North Carolina. Gray reef sharks (Carcharhinus amblyrhynchos) fighting to feed on a camouflage grouper at night in Fakarava South Pass (Tetamanu Pass), French Polynesia.French Polynesia. Whale shark (Rhincodon typus) surfaces with boat and spectators in the background. Mexico. A sand tiger shark (Carcharias taurus) surrounded by tomtates (Haemulon aurolineatum) and round scad (Decapterus punctatus) inside a wreck off North Carolina. Close up of a blue-spotted ray (Taeniura lymma) resting under a ledge. Indonesia. Two Caribbean reef sharks (Carcharhinus perezi) in the Bahamas. Blue shark (Prionace glauca) with fishing hook on the side of its mouth at twilight. Rhode Island. Rhode Island. A sand tiger shark (Carcharias taurus) surrounded by round scad (Decapterus punctatus) brushes up against my camera port. The scad cluster around the shark for protection from predators, such as jacks and tunas. North Carolina. Snappers, fusiliers, and a blacktip reef shark cluster around bait on a reef off Tahiti, French Polynesia. Headshot of a silky shark (Carcharhinus falciformis) at the surface in the Bahamas. Great hammerhead shark (Sphyrna mokarran) on sand in the Bahamas. A Caribbean reef shark (Carcharhinus perezi) swims over a colorful reef in the Bahamas. Bull shark (Carcharhinus leucas) among reef fish. Fiji. A manta ray (Manta birostris) cruises in clear, blue water off Soccoro Island. A diver swims with a juvenile whale shark (Rhincodon typus) off Bali, Indonesia. Gray reef sharks (Carcharhinus amblyrhynchos) hunt at night on a reef in Fakarava, French Polynesia. Great hammerhead shark (Sphyrna mokarran) and nurse sharks (Ginglymostoma cirratum) in the Bahamas. Gray reef sharks (Carcharhinus amblyrhynchos) fight to feed on a camouflage grouper at night in Fakarava South Pass (Tetamanu Pass), French Polynesia. Two blue sharks (Prionace glauca) at twilight off Rhode Island. Rhode Island. Great hammerhead shark (Sphyrna mokarran) at dusk in the Bahamas. A manta ray (Manta birostris) at night. Hawaii. Blacktip reef shark (Carcharhinus melanopterus) hunt on the sand at sunset. French Polynesia. Diver feeds bull shark (Carcharhinus leucas) on a shark dive in Fiji. Lemon shark (Negaprion brevirostris) eye. Bahamas. Great hammerhead shark (Sphyrna mokarran) hunting for leftover bait next to four nurse sharks (Ginglymostoma cirratum) in the Bahamas. Scalloped hammerhead shark (Sphyrna lewini) school near the surface. These mostly young females are probably seeking refuge during the daytime. Scalloped hammerheads feed at night. Costa Rica. Grey reef sharks (Carcharhinus amblyrhynchos) on a deep reef in Palau. Blacktip reef shark (Carcharhinus melanopterus) hunting on the sand at sunset. French Polynesia. Whale shark (Rhincodon typus) with boat in the background. Mexico. Divers photograph gray reef sharks (Carcharhinus amblyrhynchos) hunting at night on a reef in Fakarava, French Polynesia. Spotted eagle rays (Aetobatus narinari) in Fakarava South Pass (Tetamanu Pass), French Polynesia. A whitetip reef shark (Triaenodon obesus) circles out of a cave under stormy seas. Socorro. Sunrays above blue shark (Prionace glauca) on the surface. Rhode Island. A young tiger shark (Galeocerdo cuvier) breaches the surface with a fish in its mouth. Bahamas. Gray reef sharks (Carcharhinus amblyrhynchos) hunt in the shallows at night in Fakarava South Pass (Tetamanu Pass), French Polynesia. Two grey reef sharks (C. amblyrhynchos) on the surface at twilight. Bahamas. An oceanic whitetip shark (Carcharhinus longimanus) circling towards the surface. Bahamas. Caribbean reef shark (Carcharhinus perezi) swims up from the reef in the Bahamas. Lemon sharks (Negaprion brevirostris) on the surface in turquoise waters of the Bahamas. Split of lemon shark (Negaprion brevirostris) in turquoise waters of the Bahamas. Blacktip sharks (Carcharhinus limbatus) hunting at night in Fakarava South Pass (Tetamanu Pass), French Polynesia. Scalloped hammerhead sharks (Sphyrna lewini) come to cleaning stations during the day to have parasites and loose tissue removed by barberfish (Johnrandallia nigrirostris) and other cleaner fishes. Cocos Island. Bluespotted ribbontail ray (Taeniura lymma). Indoensia. Gray reef sharks (Carcharhinus amblyrhynchos) hunt at night in Fakarava South Pass (Tetamanu Pass), French Polynesia.French Polynesia. A sand tiger shark (Carcharias taurus) surrounded by tomtates (Haemulon aurolineatum) and round scad (Decapterus punctatus) on a wreck in North Carolina. Silky shark (Carcharhinus falciformis) with fish hook and leader under sunrays. Bahamas. Blue shark (Prionace glauca) smile. Rhode Island. An oceanic whitetip shark (Carcharhinus longimanus) up close. Bahamas. Silhouette of scalloped hammerhead shark (Sphyrna lewini) at Cocos Island. Costa Rica. A tiger shark (Galeocerdo cuvier) over white sand bottom in the Bahamas. A Carribbean reef shark (Carcharhinus perezi ) at dusk in the Bahamas. At just over 2 feet, junior here still has several years to grow before reaching adulthood (5-7 feet). Snorkeler photographs whale shark botella - the vertical feeding posture. Mexico. Head on shot of nurse shark (Ginglymostoma cirratum) at night in the Bahamas. A Pacific manta ray (Manta birostris) blocks the sun off Socorro island. A divers looks on as a sand tiger shark (Carcharias taurus) surrounded by round scad (Decapterus punctatus) baitfish swims by. North Carolina. A large tiger shark (Galeocerdo cuvier) on a stormy day. Bahamas. Motion blur of a lemon shark (Negaprion brevirostris) from below at dusk. Bahamas. Five mantas feeding on plankton at the manta ray night dive in Kona, Hawaii. A blue shark (Prionace glauca) breaks the surface off New England. A curious tiger shark (Galeocerdo cuvier) in the Bahamas about to make contact. The rare sight of a pelagic oceanic whitetip shark (Carcharhinus longimanus) over shallow reef. Bahamas. Gray reef sharks (Carcharhinus amblyrhynchos) feed on a grouper at night in Fakarava South Pass (Tetamanu Pass), French Polynesia. Caribbean reef shark (Carcharhinus perezi) at dusk. Bahamas. Lemon shark (Negaprion brevirostris) swims over orange sponge on a Bahamian reef. Manta ray (Manta birostris) at a cleaning station in Palau. Motion blur of great hammerhead shark (Sphyrna mokarran) over sand in the Bahamas. Juvenile spotted eagle ray (Aetobatus narinari) in Palau. Juvenile eagle rays are distinguished from adults by their long tail, which is almost twice as long as the body. Palau. A sand tiger shark (Carcharias taurus) in a wreck off North Carolina. Sand tiger embryos feed on eggs and other developing embryos while still inside the mother's uterus, which makes the pups stronger and preps them for a predatory lifestyle. The downside of this is that sand tigers have one of the slowest birth rates of any shark species. Whitetip reef sharks (Triaenodon obesus) hunt small reef fish hiding in the coral at nght. Cocos Island. Three sand tiger sharks (Carcharias taurus) surrounded by round scad (Decapterus punctatus) on a wreck off North Carolina. The scad cluster around the shark for protection from predators, such as jacks and tunas. A lemon shark (Negaprion brevirostris) swims over sand in the turquoise waters of the Bahamas. Caribbean reef shark (Carcharhinus perezi) at dusk under sunrays. Bahamas. A sand tiger shark (Carcharias taurus) surrounded by round scad (Decapterus punctatus) baitfish. This species has one of the slowest birth rates of all sharks and is susceptible to even minimal population pressure. It's listed as vulnerable to endangered in various parts of the world. North Carolina. Massive congregation of hunting gray reef sharks (Carcharhinus amblyrhynchos) at night in Fakarava South Pass (Tetamanu Pass), French Polynesia. A sand tiger shark (Carcharias taurus) surrounded by tomtates (Haemulon aurolineatum) and round scad (Decapterus punctatus) above gorgonians. North Carolina. Scalloped hammerhead sharks (Sphyrna lewini) come to cleaning stations during the day to have parasites and loose tissue removed by barberfish (Johnrandallia nigrirostris) and other cleaner fishes. Cocos Island. Costa Rica. Rainbow runners (Elagatis bipinnulata) accompany a whitetip reef shark (Triaenodon obesus) at Cocos Island. Costa Rica. Sharptail lemon shark (Negaprion auctidens) hunting on a reef during a grouper spawning aggregation (Epinephelus polyphekadion) at night in Palau. A white shark (Carcharodon carcharias) chases bait among mackeral scad. Guadeloupe Island. A young tiger shark (Galeocerdo cuvier) breaches the surface. Bahamas. Upclose encounter of two sand tiger sharks (Carcharias taurus). Despite their vicious appearance, sand tigers are actually rather docile. North Carolina. Caribbean reef shark (Carcharhinus perezi) swims over colorful sponges in the Bahamas. A tiger shark (Galeocerdo cuvier) at night. Bahamas. Nurse sharks (Ginglymostoma cirratum) feeding in a marina in the Bahamas. Gray reef sharks (Carcharhinus amblyrhynchos) feeding on a grouper at night in Fakarava South Pass (Tetamanu Pass), French Polynesia.